The Sharp distance sensors are a popular choice for many projects that require accurate distance measurements. This IR sensor is more economical than sonar rangefinders, yet it provides much better performance than other IR alternatives. Interfacing to most microcontrollers is straightforward: the single analog output can be connected to an analog-to-digital converter for taking distance measurements, or the output can be connected to a comparator for threshold detection. The detection range of this version is approximately 4 cm to 30 cm (1.5″ to 12″). The GP2Y0A41 uses a 3-pin JST PH connector that works with our 3-pin JST PH cables for Sharp distance sensors (not included), as shown in the upper picture on the right. These cables have 3-pin JST connectors on one end and are available with pre-crimped male pins, pre-crimped female pins, and with unterminated wires on the other end. It is also possible to solder three wires to the sensor where the connector pins are mounted (see the lower picture to the right). When looking at the back, the three connections from left to right are power, ground, and the output signal. Family of brackets for Sharp GP2Y0A02, GP2Y0A21, and GP2Y0A41 Distance Sensors. This product replaces the original GP2D120XJ00F. The newer GP2Y0A41SK0F has a much higher update rate and much lower average current draw than the older GP2D120, but it is otherwise identical to the GP2D120 and can be used as a drop-in replacement for those modules. The relationship between the sensor’s output voltage and the inverse of the measured distance is approximately linear over the sensor’s usable range. 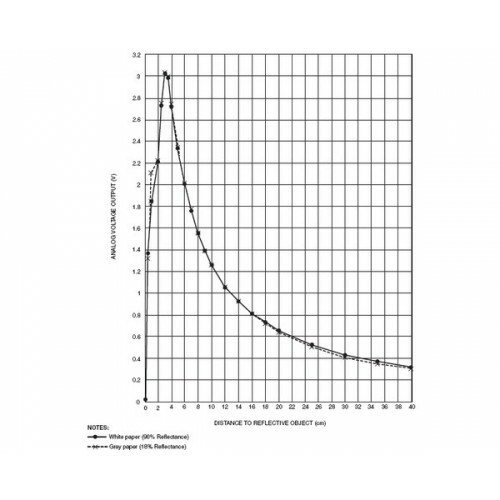 The GP2Y0A41SK0F datasheet (1MB pdf) contains a plot of analog output voltage as a function of the inverse of distance to a reflective object. You can use this plot to convert the sensor output voltage to an approximate distance by constructing a best-fit line that relates the inverse of the output voltage (V) to distance (cm). 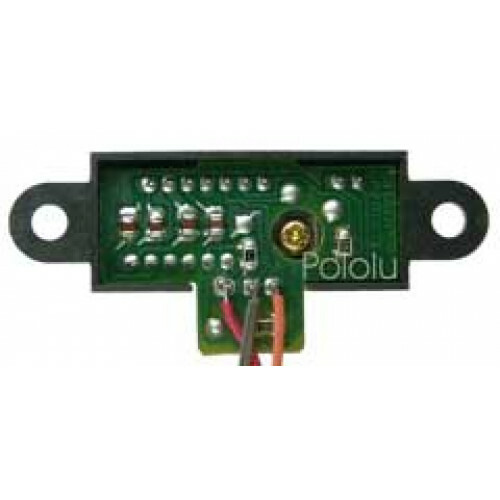 Pololu have a variety of Sharp distance sensors to choose from, including the shorter-range (2 – 15 cm) GP2Y0A51SK0F, medium-range (10 – 80 cm) GP2Y0A21YK0F and long-range (20 – 150 cm) GP2Y0A02YK0F. 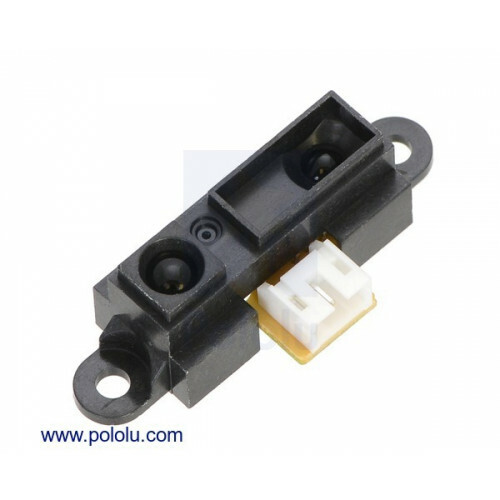 Pololu also carry the newer Sharp GP2Y0A60SZ analog distance sensor (10 – 150 cm), which outperforms the other analog Sharp distance sensors in almost all respects, offering a low minimum detection distance, high maximum detection distance, wide 3 V output voltage differential, high 60 Hz sampling rate, operation down to 2.7 V, and optional enable control, all in a smaller package. 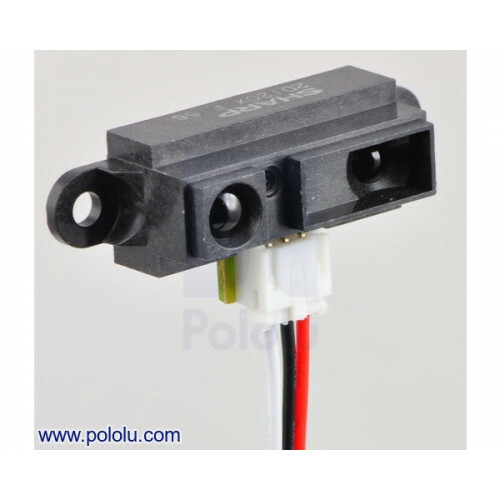 Pololu also carry three digital Sharp distance sensors that have low minimum detection distances and a high 400 Hz update rate. They are available with a 5 cm, 10 cm, or 15 cm range and simply tell you if something is in their detection range, not how far away it is. They are smaller than the analog Sharp distance sensors and draw less current. Typical; can be as low as 50 Hz. Average; this sensor draws current in large, short bursts, which is why it is recommended a 10 µF capacitor or larger be placed across power and ground close to the sensor.